A large extraterrestrial object exploded over the heads of the first Americans about 13,000 years ago, wiping them out and making big mammals and other prehistoric creatures disappear, according to a new U.S. study. Presented last week at the American Geophysical Union meeting in Acapulco, Mexico, the controversial research proposes that the extraterrestrial blast triggered a catastrophic millennium-long cold spell. The dramatic climate change would have been the major cause for the sudden disappearance of mammoths throughout much of Europe and America and the demise of the Clovis people, the New World's most sophisticated hunters. "The impact occurred precisely when the megafauna suddenly disappeared from North America. The Earth, which was warming from the last ice age, was plunged suddenly into a 1,000-year period of cooling known as the Younger Dryas," nuclear scientist Richard Firestone of Lawrence Berkeley Laboratory in California, told Discovery News. A sort of "mini ice-age," the Younger Dryas swept across the globe at the end of the Pleistocene epoch — a period of time spanning from about 1.8 million years ago to 11,500 years ago — making Earth shiver through one final cold spell before entering the warm Holocene epoch. The major cause of this dramatic climate change has long been seen in the melting of a massive ice cap that covered most of North America. Running off the ice cap, the cold meltwater ended up in the northern Atlantic Ocean, interrupting the motion of the North Atlantic Drift, a powerful warm ocean current that had acted as a sort of heater for the northern hemisphere. The result was an abrupt climate cooling. The explanation fits well with the extraterrestrial theory, according to Firestone and colleagues, who suggest that the major cause for the ice cap melting was heat from the extraterrestrial impact. The main evidence for the new theory lies at various sites in Europe, Canada and America, Firestone and colleagues reported at the conference. Geochemical analysis revealed that metallic microspherules are enriched in iridium, while the carbon spherules contain nanodiamonds and fullerenes — all extraterrestrial markers. According to the researchers, they are possibly the remains of a giant carbon-rich comet that exploded and spread debris across the continent. While intriguing, the controversial theory has raised widespread skepticism among scientists. Missing in the theory is a crater marking an impact, though the researchers argue that the comet burst either in the air or into the Laurentide ice sheet north of the Great Lakes, which would have absorbed much of the impact. 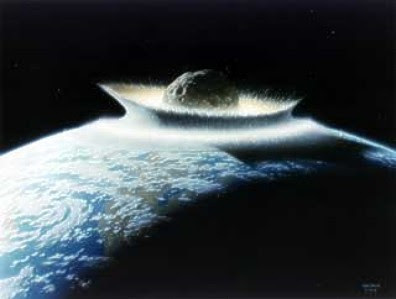 But most of the debate is focused on whether the comet impact could have triggered the Younger Dryas. That theory "requires an extraordinarily huge leap of faith," according to climatologist Andrew Weaver of the University of Victoria, Canada. "Over the last glacial cycle, there have been many millennial scale oscillations in climate of which the Younger Dryas is the last major one. If you want to evoke a comet for the Younger Dryas you have to find comets for every other such event," Weaver told Discovery News.